Advent Calendars Your Kids Will Love! The Best Advent Calendars for Kids in 2018! It’s that time of the year again! You know the Holidays are right around the corner when the new Kids Toy Advent Calendars start popping up! September has just begun and we already have a ton of great Advent Calendars for kids. Advent Calendars have long been a holiday tradition in our home. In the past, the Elf has brought them the first day of December when he makes his first appearance for the season. The kids love to wake up to a new treat each day. Typically Lego and Playmobil Advent Calendars have been the most popular in our house. This year, though, there are some new Advent Calendars for kids. Every year, popular Advent Calendars do sell out, so be sure to join our Facebook Group here for in stock updates! You can also follow our Amazon List of Kids Advent Calendars here. In addition to our list of Advent Calendars, we have also pulled together a list of our favorite Holiday Books! You can check it out here (it includes Hanukkah, Kwanzaa and Interfaith books). What are the best Kids Advent Calendars? The most popular Kids Advent Calendar for 2018 is sure to be the LOL Surprise #OOTD Outfit of the Day Advent Calendar, which is currently IN STOCK at Amazon! We expect it to be pretty tough to find after the initial release. Walmart does have a listing up here and we are stalking it like crazy. The best place for an update on when it stocks is our Kids Steals & Deals group here. 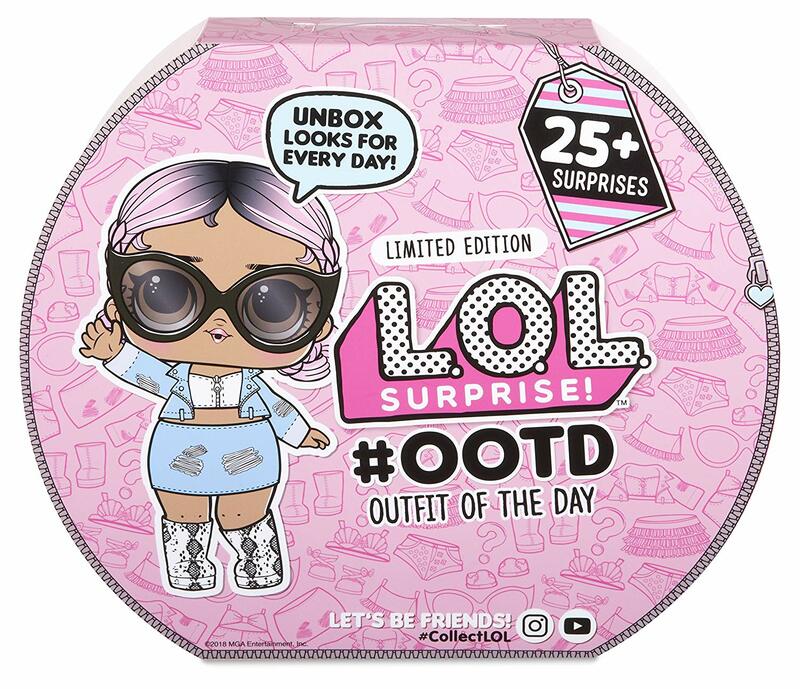 The L.O.L Surprise #OOTD Outfit of the Day Advent Calendar is in stock at Amazon. We expect Walmart & Target to stock online as well, as early as this week. The retail price will be $29.99. Be sure to only purchase the calendar from authorized retailers. When buying from Amazon or Walmart, be sure that they are the seller and that it’s not a 3rd party. 3rd Party prices are always inflated. There are tons of fake L.O.L Surprise Dolls sold from China. Buying direct ensures you pay the right price and get an authentic product. Are there L.O.L Surprise #OOTD Outfit of the Day Preorders Available? When you search for the L.O.L Surprise Advent Calendar, a couple of sites like Knick Knack Toy Shack and P is for Party are advertising L.O.L Surprise preorders at prices well above retail. These are not authorized sellers of L.O.L Surprise. My guess is that they buy them up at retail to resell. At this point they have not been released online and have not been seen in stores. We have no idea what the quantity available will be or how hard they will be to find. I would not recommend purchasing from a site like this and paying double for something that you can likely find at retail. Toddlers do not have as many options as older kids. Playmobil 1-2-3 and Little People both have Advent Calendars that are currently available. There will also be a Vtech GoGo Smart Wheels Amazon Exclusive Advent Calendar, but it is not yet available. There are a number of Kids Advent Calendars that are perfect for Preschoolers! The Paw Patrol Advent Calendar is probably the most popular. Last year it was tough to catch in stock. Thomas The Tank Engine Minis Advent Calendars are also popular. We have not seen a new one for 2018 yet, but last years can be found here. The Hatchimals Colleggtibles Advent Calendar is new this year and promises to be popular with the older preschool age group. Finally, the Schleich Farm Advent Calendars are quite popular as well! For the older kids, Star Wars Advent Calendars are by far the most popular. 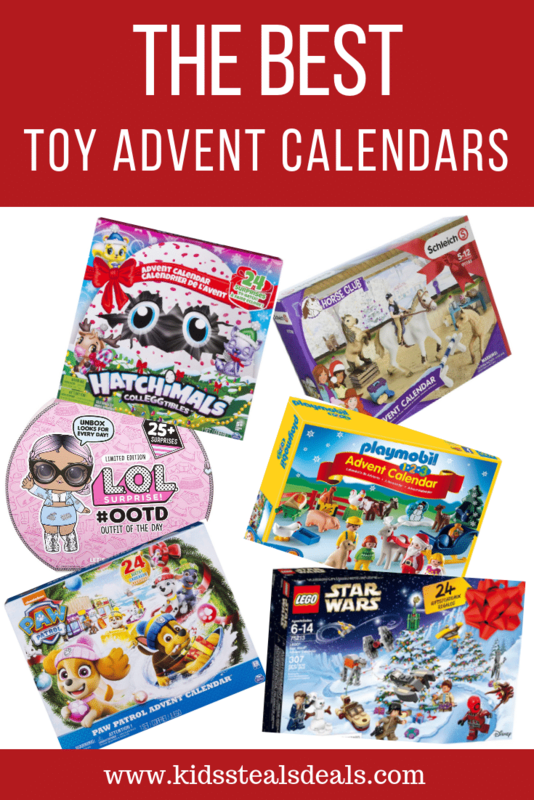 Each year Lego releases 3 versions – Lego City Advent Calendar, Lego Friends Advent Calendar and Lego Star Wars Advent Calendar. In years past, these calendars have sold out by mid-late October. Last year they did last into November, but if Lego is your plan, best to play it safe and grab it now. As mentioned above the L.O.L Surprise #OOTD Advent Calendar will also be a very popular option in this age range. With a wide range of toy Advent Calendars to choose from, it should not be hard to find something you child will enjoy. Even if you are on a tight budget, there are currently some prior year options that are very reasonably priced! Having a 2018 version is not important, the windows are opened on the 24 days of December and they make no reference to day of the week or anything. You can shop the full selection of calendars available by clicking the images below! Next Post Popular Toddler Holiday Toys – Where to find the Step2 My First Snowman, My First Christmas Tree, My First Gingerbread House + More!